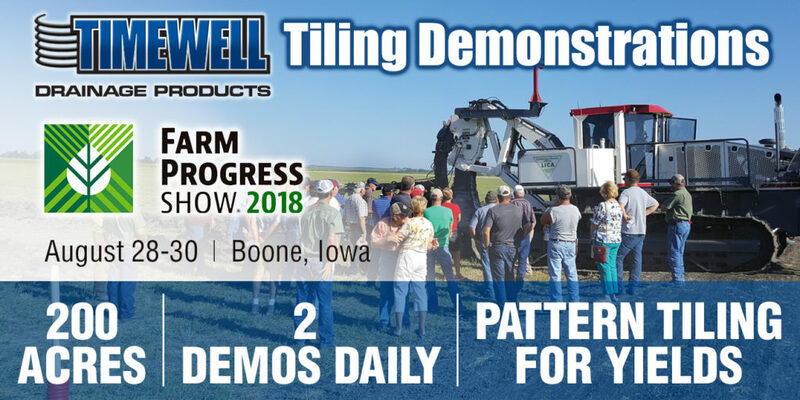 Timewell Drainage Products and Farm Progress Show are pleased to announce an exclusive partnership to perform tiling demonstrations at the Boone, Iowa show site starting at the 65th annual event August 28-30, 2018. Farm Progress Show is the largest outdoor farm event in the nation featuring 600 exhibitors and average attendance of more than 100,000 people in 46 states. Tiling demonstrations will take place at noon each day of the three day event, weather permitting. This is a six year, three show project that will substantially drain 200 acres at the permanent bi-annual location in Boone and help prepare it to handle possible weather impacts. Timewell, Farm Progress and the six drainage contractors are working in partnership with the host farmers and Central Iowa Expo to make these demonstrations possible. For more information, visit timewellpipe.com/tilingdemonstrations or connect with us on Facebook and Twitter.